Clean and secure your USB flash drive. Is there a better alternative to USBMate? Is USBMate really the best app in Optimizers category? Will USBMate work good on macOS 10.13.4? Its contents will be clean and optimized, without useless junk. All temporary files left by Mac OS X 10.6/10.7 or Windows (.DS_Store, .Trashes, .Spotlight-V100, Thumbs.db, etc.) will be erased. It will be made secure thanks to the built in anti-virus! 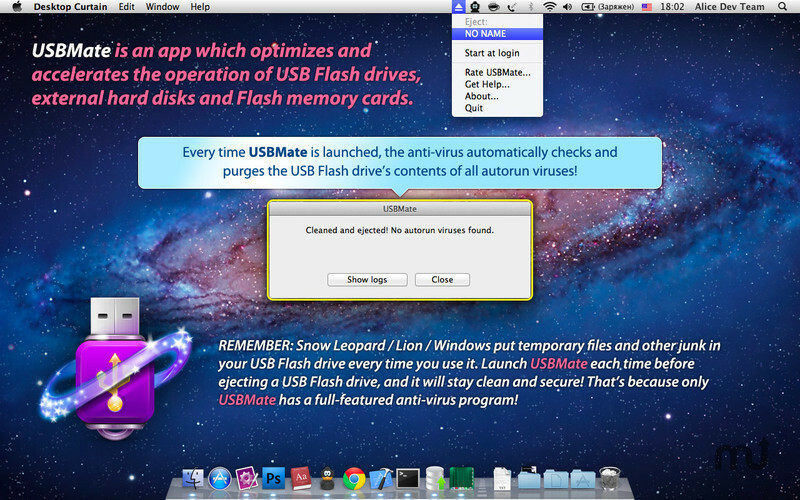 Every time USBMate is launched, the anti-virus automatically checks and purges the USB Flash drive's contents of all AutoRun viruses! Note: The demo version is currently at 1.2. The version available for purchase on the Mac App Store is 1.1. USBMate needs a rating. Be the first to rate this app and get the discussion started! All you have to do is launch the app before ejecting the USB Flash drive: A few seconds later, it will be optimized, clean and secure! Remember: Mac OS X 10.6/10.7 and Windows put temporary files and other junk in your USB Flash drive every time you use it. Launch USBMate each time before ejecting a USB Flash drive, and it will stay clean and secure! That's because only USBMate has a full-featured anti-virus program! When you erase files from a USB Flash drive, they're only moved to the trash. The data itself isn't erased. Use USBMate and see how much free space is really left in your USB Flash drive. It's one of the most practical utility apps to use every day with Mac OS X 10.6/10.7/10.8/10.9/10.10.